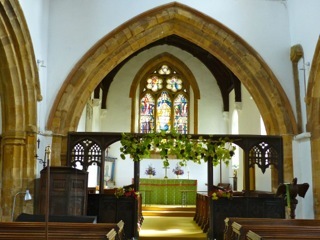 The church in Ravensthorpe plays an active part of village life, and is particularly well supported by the wider village for the traditional church and rural festivals over the year, and valued for family events including weddings, funerals and baptisms. Regular congregations are between 15 and 40 depending on the service type, and we also have a small but active choir, who support our Common Worship and Worship for All services, and we offer a chance for the congregations to share fellowship over refreshments. The church also provides a monthly village and church newsletter, delivered to all properties in the village. The village of Ravensthorpe lies between East Haddon, Guilsborough and Spratton. The village population includes plenty of families, couples, and single residents of all ages. The village possesses a shop, a busy pub and a working farm. It also has several active businesses, including Torquemeters - winner of a Queen’s Award for Export – and Horace Batten Bootmakers, a highly successful eight-generation family business. Ravensthorpe has a village hall, which is well used by the community for regular events and activities and a playing field and pavilion. There are several active village organisations, including WI, a bookclub, and dance and keep-fit classes. The Village Cinema operates from the village hall, which also hosts regular morning coffee and lunch events and a popular series of monthly talks. 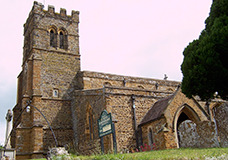 The current church building is believed to be around 800 years old, and is constructed largely from local Northamptonshire brown ironstone. It is believed that a church building (albeit possibly not any part of the present one) has existed on the site since the time of William the Conqueror. The church is of a standard design/layout for its age, including a square clock/bell tower, a nave, north and south aisles, and chancel. Doors are found in both north and south aisles and also the chancel. The outside of the building includes a few interesting features, including an early “sundial” on a buttress adjacent to the porch on the south door, and an interesting memorial inscription on a stone on the north wall of the chancel. Inside there is a great chest, which stands in the place which was originally the altar of the lady chapel. The age and origin is uncertain, but it is thought to be 4-500 years old, and is estimated to weigh ¾ of a ton. The stained glass window in the chancel was designed and installed in the 1930s by Christopher Webb, and shows Christ in Glory, St Denys, Genevieve, and various shields and coats of arms. The pulpit dates from the Jacobean era and was given by John Breton of Teeton in 1619, whilst the lectern was purchased by the church in 1867, and depicts a wooden carved eagle. The churchyard is relatively extensive, and remains “open”, and includes an area (adjacent to the village allotments) added more recently, currently in use for burial. More detail can be found in the church history leaflet available in the church, or from one of the Churchwardens. 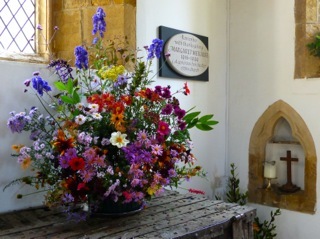 For pastoral matters or to enquire about booking any services, please contact either the Rev. Chris Peck or the group administrator, Katrina Jones. Details for both can be found on the Contact Us page.